If I hadn't been born with a heart defect and gone through open heart surgery when I was 3 years old, I wouldn't be the mommy that I am today. Ok, maybe that isn't a big secret. But sometimes I need to remind myself of this when I get to complaining about not having enough energy to keep up with the kids, or not being able to shake my control freakishness. 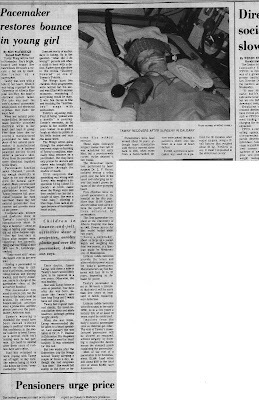 My dad found this article that was published in the Lethbridge Herald in 1981 after I had my first open heart surgery. Some of the article is a bit inaccurate (I had my surgery in Edmonton, not Calgary as it states on the photo. And I never did wear any funky pad thing over my pacemaker while I played). This is the single most life altering event in my life. Most of my personality was shaped by this. I was small, helpless, I barely had language down when doctors performed surgery to save my life. Being out of control has formed my brain into supreme control freak. Perfect for being a mommy of 2 rambunctious, super smart children. 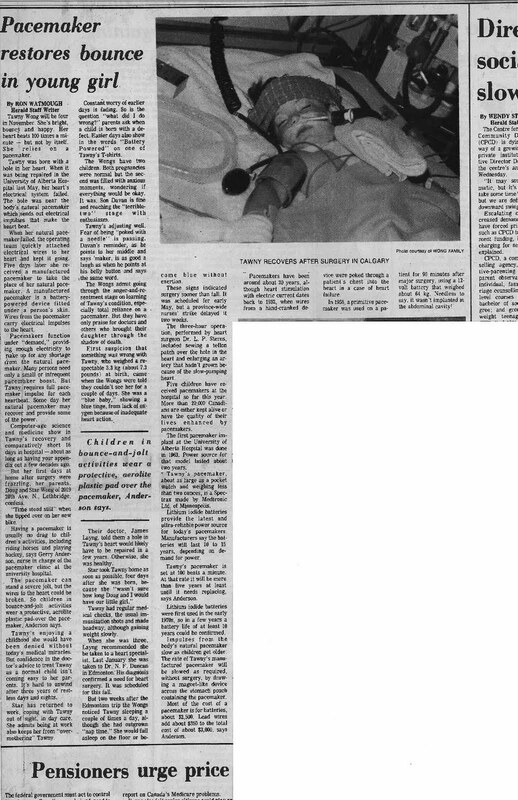 I was told for many years after this surgery (until I was in my late teens in fact) that I shouldn't think about having kids. Too dangerous with my condition. When I was told by my high risk obstetrician that I could try, all these hidden emotions came back to me. I really wanted to be a mommy. This experience of thinking that I would be childless made my first pregnancy extra special and overwhelming. When docs said I was strong enough to have a second child, that pregnancy was equally as special and overwhelming. 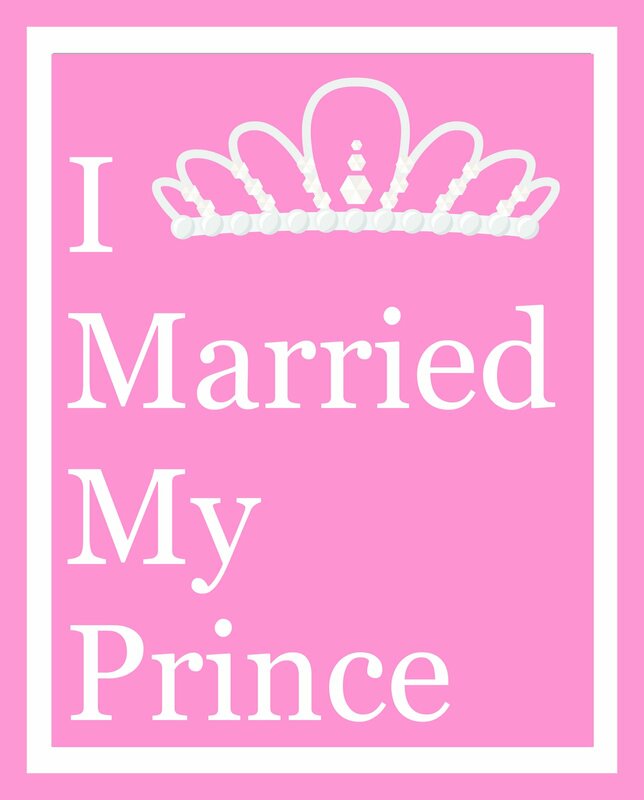 After years and years of thinking that I would never feel what it was like to have a child grow inside of me, or kick, or wiggle, I felt so blessed and strong to be able to go through it - twice! I vowed that I would be the best mommy I could be no matter what because all of this wasn't even supposed to happen to me. So whenever I get down, or tired and complain about having to go through doctor's appointments or pacemaker adjustments or healing after valve surgery, I need to remember this: I wouldn't be the mommy I am today without having gone through all of this hoopla. I am truly blessed and lucky to be a mommy and I will love, nurture and teach my 2 little miracles for as long as I have breathe in me. 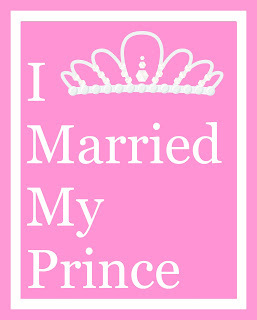 I'm sharing this confession with the lovely Kim at All Work and No Play Makes Mommy Go Something Something. Check out all the other confessions there, and write your own to link up! These corn muffins are super easy to make and they are Terry's favourite. The kids like to help with this one and since it's so simple, it's pretty easy for Logan to stir and help pour the ingredients into the mixture. These muffins only take one bowl so the clean isn't terrible either. Preheat oven to 400 degrees F (200 degrees C). Line muffin pan with muffin liners. In large bowl, mix together cornmeal, flour, sugar, baking powder and salt. Into the same large bowl, Add egg, oil and milk. Stir gently to form batter. Spoon batter into muffin liners. Bake for 15 to 20 minutes until toothpick inserted into muffin centre comes out clean. Logan and Terry ate all of these muffins in about a day and a half. Lane hasn't been allowed to eat anything cornbread related since she keeps getting sick every time she eats too much of it at Montana's. I can't eat them because of the high milk content, but the few tastes I did try were yummy nummy! They make for a less sugary or salty snack than candy or chips which is what Logan usually wants. Fine then, I've only got one thing to say anyway. I'm at week 5 of my healing. One more week and I can try to pick up my kids! Well... maybe I'll try to lift Lane, and we'll see about Logan in a few more weeks. Anyway, since Terry has been home watching the kids (you wouldn't believe how much lifting you have to do during the day until you can't do it), I've been able to do some fun handsewing-type projects. No heavy lifting required! I'm going to be doing a craft sale coming up in the middle of May. I'll let you know the details when the date is closer. So, I've been working on restocking some of my most popular craft sale items. After all I'm not all about video game coasters (although they are still the biggest craft sale seller). Do you like my new Capris? They will be awesome to wear while running around after the kids this summer. So comfy. And do you believe that they used to be maternity pants? Yup - that is me wearing the "before" pants. I loved these pants when I was pregnant. My aunt sent them to me to wear and I wore them A LOT! But what to do with them now? I tried to continue wearing them for awhile, but they just made me look like a fat slob. Too baggy in all the wrong places. But still so comfy. I decided they needed a Capri make-over! These pants have two pretty pink stripes along the sides. I didn't want to touch those, so I had to do the adjustments along the in-seam. Turn your pants inside out. Try them on. Very carefully pin along the in-seam where you would like to "take in" the pants. This can be a little tricky. Be sure not to poke yourself! Make sure also to mark where you would like to cut off the pants. Capris can be any length from mid-ankle to right above your need. Whatever is your personal preference. I marked mine a little below my knee. If you don't wanna stare at the picture of my crotch (above) then here is another picture of the pants laid out. Those tiny white dots are actually the pins I used to measure. The ones in the middle of the pants are marking the length I want. 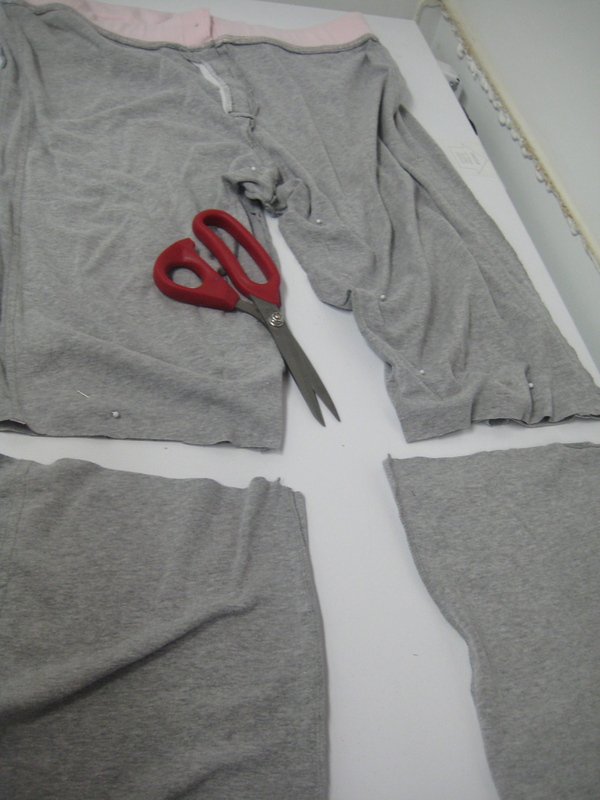 - Cut the legs of the pants off a little bit below the marking you made to allow to a hem. - sew in a line along where your pins are. All the way up one leg's in-seam, through the crotch and down the other leg's in-seam. Be sure to stitch twice over the crotch area because it's where most of the wear on the garment will be. - Cut the excess fabric away from your seam. Leave a little bit of fabric there to finish seams. I left mine unfinished because I was using a pair of knit pants that don't fray anyway. Finish the seams with a serger or a zig zag stitch if you're using a fabric that frays. As always, if you try out this tutorial with a pair of your own maternity pants, I would love to see the results. You can email me (link in my profile) with a photo, post a blog about it and link it in the comments below, or share on the Tawny Bee Flickr Group. Nope, the diagonal clove hitch is not some sort of new wave Yoga pose. It's Macrame silly! Which must mean that it's Macrame Monday! Today we're going to work on the diagonal clove hitch to make a pretty X pattern on our headband. 1) Basically, this knot is the same as the horizontal clove hitch knot that we learned last week. The only difference is the way we pin our anchor cords. To make an X. we take the two outer most cords (one from each side) and pin them across to give them an X shape. I taped them all prettily on my deep freezer to show you. Nice eh? 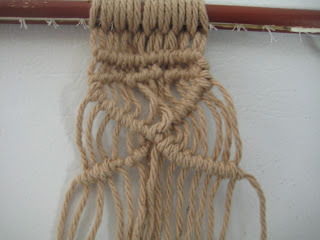 2) Do a regular clove hitch from each side. Be careful to keep the cords in order. When you're going to the left, the knots are tied from left to right. When you're knotting the cord going down to the right, the knots are tied from right to left. 3) Cross the anchor cords in the centre and keep knotting until the full X is complete. Actually, you can pretty much make any shape you want by using different cords as your anchor cords. Next week I'll show you how to start in the middle and make a pretty diamond shape in our headband. but hey, I'm still learning. Wouldn't it look really cool with some beads threaded on the straight parts? Oooh... I better hurry up and learn some more so that I can show you how to do that! *sing* We're all looking for bunny clues. We're all looking for bunny clues. I you haven't had the wonderful opportunity to watch Blue's Clues about one hundred zillion times, then just ignore our little Easter song hehehe. Logan left his Easter basket out last night with a plate full of lettuce for the Easter bunny. Yum yum! And the Easter bunny left him a series of clues to find his candy. The Easter bunny used GIMP to write clues on the pretty Easter printables. Here are the clues if you were curious. They rhyme - oh that clever bunny! The Easter Bunny is playing a trick on you. You'll have to hop to it and figure out this clue. Where are the candy and treats? Maybe in the kitchen under the seats? Maybe he hid something near the exercise machine? But the bunny was kind and left a note. Could your candy be where you hang your coat? But the candy and treats are almost caught. Could they be hiding in your favourite hide and seek spot? Logan and Lane love to hide under the covers in mommy and daddy's room. And there's where they found the candy! All of Logan's favourites - Sponge Bob, Cream Eggs and Kinder Surprise. All of Laney's Favourites - marshmallow Peeps and Smarties. Plus a puppy with bunny ears! I hope all are having a terrific Easter. We will be enjoying one terrific turkey dinner tonight. Yay! It's my fault that Lane's hair is so curly. There! I've said it. For more years than I can remember, I've been telling everyone that my hair is straight. After all, when it is long, it is pretty straight. There's no hiding now that my hair is short. 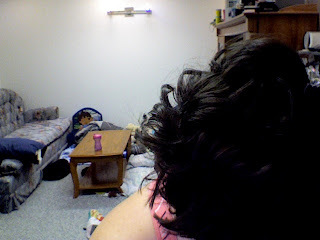 Somehow I don't remember it being this curly the last time it was short. But that was back in Alberta in a dry climate. This more humid Manitoba climate is destroying my happy self-image of long flowing, sorta wavy (but never curly) hair. Look at this sweetheart. Isn't she adorable? Now that Lane's finally grown some more hair, she's kind of got an Einstein meets Troll Doll look. She rocks it! Her mama however, it a whole other story. 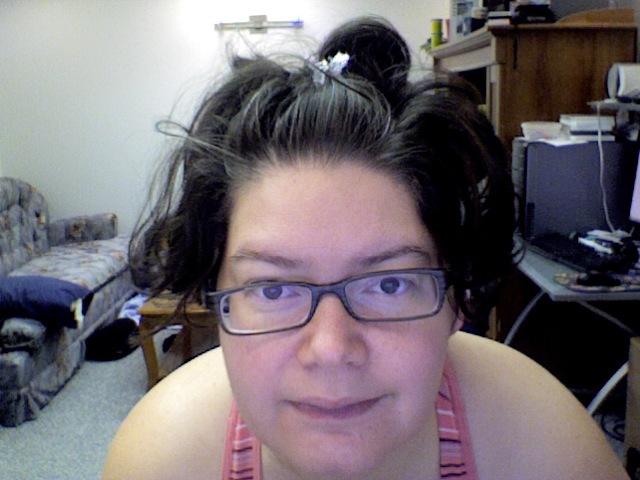 I can't say that I can rock the messy curls look, especially in the morning. Yikes! I just woke up and it's all over the place. The clip does nothing to keep these curls from escaping. And the back? Yup, definitely curly bonkers! Gah! And all this time I was blaming Lane's sweet curly cues on Terry. 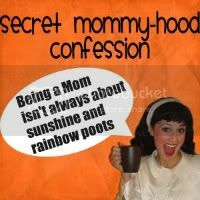 I'm sharing my confession over at All Work and No Play Makes Mommy Go Something Something. Dish your own dirt, if you dare! Tawny Bee on Etsy is having an Earth Day/ Easter sale this weekend! The sale will run from Today (Friday April 22nd - Earth Day) through the weekend until Tuesday April 26th. All you gotta do to enjoy 10% off your purchase is enter "WESTEASTERSALE2011" into the coupon code section when checking out. Yay! There are a ton of Winnipeg Etsy Street Team shops participating in this wonderful sale as well. For a complete listing check out the WEST blog (and follow that awesome blog because I post over there quite a bit and they always have all the info about sales and promotions from all the WEST shops). Little Bunny Bath Mitts for the kids! It seems that the Easter Bunny is a pretty good sewist. He got the tutorial from a very talented mommy over here. And he'll leave them in the kids' baskets this weekend. He used fabric that he already had in his stash. Bonus! And look at that cute little bunny tail! At least we'll have one thing in the baskets that isn't candy.